Hydraulic fracturing or “fracking” wells are larger and take more time to drill than conventional petroleum wells. The fracking process also requires more venting, and produces more flow back than the conventional process. “Fracking solution is made up of water laced with petroleum distillates, sometimes diesel fuel, as well as many other additives. Many fracking additives are carcinogenic or mutagenic. Many are kept in secret. In the United States, such secrecy has been abetted by the ‘Halliburton loophole’ [named after an energy company headquartered in Houston, Texas], which exempts fracking from many of the nation’s major federal environmental-protection laws, including The Safe Drinking Water Act. One-fifth of the fracking fluid flows back up the well to the surface in the first two weeks, with more continuing to flow out over the lifetime of the well. Fracking also extracts natural salts, heavy metals, hydrocarbons, and radioactive materials from the shale, posing risks to ecosystems and public health when these return to the surface, The flow back is collected in open pits or large tanks until treated, recycled or disposed of” (Howarth). Fracking happens not only inland, but in offshore environments, where frack-solution can be dumped directly back into the ocean. The federal government has given oil companies permission to dump more than 9 billion gallons of wastewater a year into the ocean off California’s coast (Center for Biological Diversity). Not knowing what is actually in the fracking solution makes it difficult to ascertain its biological effects, and impedes technologies from being developed to process the toxic wastes. With no information, federal and state environmental agencies may not be able to prevent or mitigate damaging effects to ecosystems and public health. The fracking solution can also be reused in other fracking operations, or it may be disposed of. Tens of thousands of wells are used around the United States to inject solution deep underground. It can also be injected into aquifers considered to be unsuitable for drinking water standards. Mismanagement and pollution of aquifers can be devastating to people and industries who rely on them. Injection of pollutants into aquifers is also unsuitable for environmental health from any perspective. “Almost 3 billion gallons of oil industry wastewater have been illegally dumped into central California aquifers that supply drinking water and farming irrigation” (Center for Biological Diversity). On top of pollution concerns, deep injection can and has also caused earthquakes. “Scientists have known for decades that injecting huge volumes of liquid underground - such as waste from hydraulic fracturing, or fracking - can set off quakes. But in most cases it doesn’t, and scientists can’t predict when or where such quakes will happen” (Weyman). Fracking wells in areas that are sensitive to seismic activity, or in populated areas, are unsuitable for underground injection; these operations may send the fracking solution to municipal water treatment plants. “Municipal sewage treatment plants are simply not designed to handle the types of materials in frack-return fluids, not only are these facilities ineffective at handling these wastes, but the toxic materials and high salt levels kill the beneficial bacteria required to treat the sewage” (Howarth). 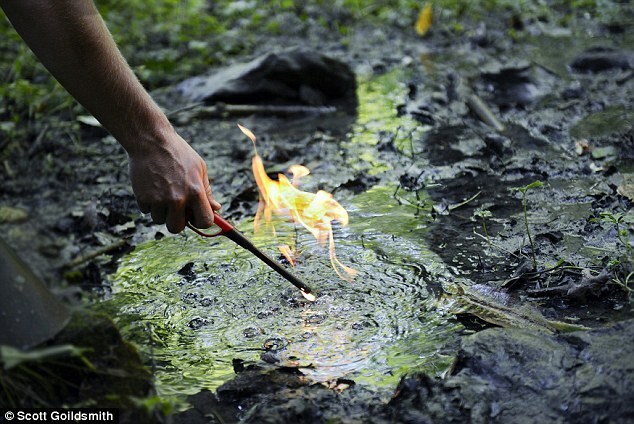 During and after the fracking process, methane and other gases are released into the air. These are often burned to mitigate their greenhouse effect. Technologies have been adapted to utilize and catch these gases, but many fracking operations lack the expensive equipment to do so. Some studies suggest pollution of aquifers and soil occurs at the well, not just migration from the deep fractures. “Noble gas isotope and hydrocarbon data link four contamination clusters to gas leakage from intermediate-depth strata through failures of annulus cement, three to target production gases that seem to implicate faulty production casings, and one to an underground gas well failure. Noble gas data appear to rule out gas contamination by upward migration from depth through overlying geological strata triggered by horizontal drilling or hydraulic fracturing” (Poreda). This study disconcertingly does not account for flows entering the water or soil during drilling. It additionally suggests that well integrity is especially important to ecosystem protection. Whether wells are prone to leakage depends upon the quality of the build and age. Different states and companies have varying standards to regulating how much experience well builders are required to have. Wells must be capped to prevent flow back and gas leakage, and eventually all will fail over time, so a well must be capped and repaired in perpetuity to be effective. To effectively mitigate the damage caused by amounts of waste created from fracking operations, more industry transparency about the solution content must be demanded. New technologies can prevent leakage, but they cut into the company's bottom line, so they are not apt to fund studies on new technologies. “Penn State depends hugely on industry money. And not just on the oil and gas industry, on pharmaceutical companies and on weapons manufacturers, and on the government. All major research universities do – not just Penn State” (Koenig). Some research is being conducted on remediation, such as silica encapsulated biocatalysts for bioremediation of frack-solution (Aksan), and diversified approaches to bio-stimulation and augmentation strategies for heavy oil contaminated soil (Lladó). Research into these types of technologies is of paramount importance to remediating the massive amount of toxic fracking solution used in the wells. By pumping fracking solution into the ground and capping the well, we are only creating pollution for future societies to deal with. Extraction corporations by-and-large are not considering keeping drinking water safe, protecting farmland, and preserving healthy habitats from pollution. Any additional infrastructural requirements cost extraction corporations more money. Providing that hydraulic fracturing is one the dirtiest and most expensive ways to extract oil, it makes sense that we see so much corporate lobbying against environmental and economic controls of fracking. If fracking companies were to be responsible for mediating all the damages from their actions, there would be no profit in hydraulic fracturing. Aksan, A., & Sadowsky, M. (n.d.) Silica encapsulated biocatalysts for bioremediation of fracking wastewater. University of Minnesota. Center for Biological Diversity (2014, October 6). Documents reveal billions of gallons of oil industry wastewater illegally injected into central California aquifers. Center For Biological Diversity. Center for Biological Diversity (2014, September). Troubled waters offshore fracking’s threat to California’s ocean, air and seismic stability. Center For Biological Diversity. Conti, D. (2014, September). Yale, Penn State studies offer conflicting views of fracking. Triblive. Howarth, R. W. (2011). Should fracking stop? Cornell Department of Ecology and Evolutionary Biology. Koenig, S. (2011, July 8). Game Changer. This American Life. Lladó, S., Solanas, A.M., De Lapuente, J., Borràs, M., & Viñas, M. (2012). A diversified approach to evaluate biostimulation and bioaugmentation strategies for heavy- oil-contaminated soil. Science of the Total Environment. Poreda, R. J. (2010, November 27). Noble bases identify the mechanisms of fugitive gas contamination in drinking-water wells overlying the Marcellus and Barnett Shales. National Academy of Sciences of the United States of America. Sheppard, K. (2013). Confirmed: Fracking triggers quakes and seismic chaos. Mother Jones. Wayman, E. (2013). Huge quakes foretell smaller ones. Science News.